A construction site accident killed three workers on Key Largo Monday. They were killed after entering a manhole filled with toxic fumes. Several others were injured by the fumes, including a firefighter who was left in critical condition after attempting to rescue the workers. 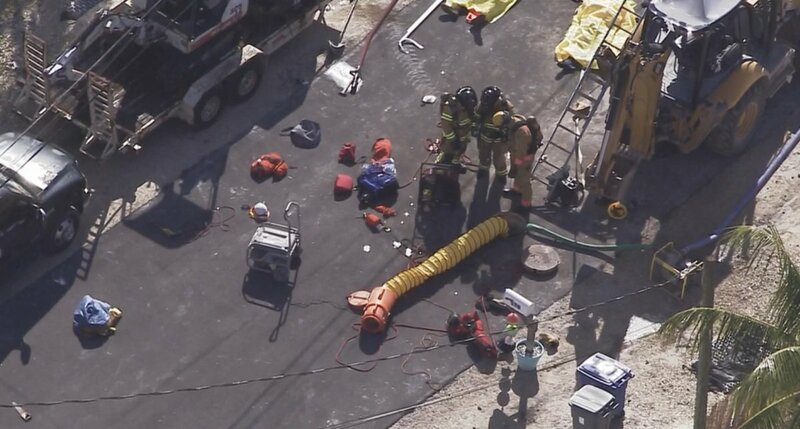 A construction accident killed three workers on Key Largo Monday morning. According to Monroe County Sheriff’s deputies, the construction workers went under a freshly paved road in order to check on the way it was settling, when they each stopped responding one by one. The Washington Post reports that initially one worker removed a manhole cover and went underneath the hole to inspect the road above. After he eventually stopped responding another worker entered to check on him. That worker, too, eventually stopped responding and yet another worker went in to check on what was happening. The men were all killed by poisonous fumes which had collected in the hole. A firefighter also attempted to rescue the men, and was overpowered by the fumes. He was airlifted to a Miami area hospital and was listed in critical condition as of yesterday. Citing a Miami Herald write up, the Post reports that rotting vegetation produced hydrogen sulfide and methane gases, which collected in the hole. The entrance to the hole was reportedly very tight, and did not allow enough clearance for at least one of the men to enter with his oxygen tank. Several sheriff’s deputies were hospitalized after being exposed to the fumes, and at least five local homes were evacuated while a Hazmat team conducted tests.